Wilfrid Laurier University’s Waterloo campus will be holding their convocation ceremonies for graduates starting on Monday, June 12. 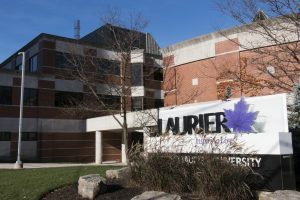 Taking place from June 12 to 16, 11 ceremonies will be held on the Laurier Waterloo campus. Since May 31, approximately 2,865 students met all program requirements and are now qualified to graduate. The university announced that they expect to confer 247 graduate degrees, 2,609 undergraduate degrees and nine diplomas. This year’s spring ceremonies will also mark Laurier’s 100,000th graduate as well as the 5,000th student to graduate on the Brantford campus. This is the first year the Waterloo convocation ceremonies will be taking place in the Lazaridis Hall auditorium, which holds 1,000 seats for both graduates and guests. In past years, students were placed in Laurier’s Athletic Complex. “When we were on campus in the gym we’d have [students] get their gowns in one building and then go line up in another building across campus, so it was a bit of a challenge getting people from place to place, so it’s now all in the same building which is fantastic,” Sondra Schwartz, Laurier’s manager of ceremonies and events, said. During the convocation ceremonies, Laurier will also be recognizing the stories of Nairn Carter, a graduate who overcame personal challenges to achieve her bachelor’s degree in science, and Ann and Maverick Lyddon, a mother and son duo who are both graduating this year from Laurier. Honourary degree recipients who are also being recognized during the ceremonies include William Richardson, an accomplished writer, composer and broadcast host, and David Young, a highly recognized and award-winning composer and musician. The university will also be presenting the University Research Professor award, along with several other teaching awards and student teaching awards, during the ceremonies. Glenda Wall, an associate professor in the department of sociology, and Paul Pulford, a professor in the faculty of music, will be recognized with the Wilfrid Laurier University Service Excellence Awards. Carl Zehr, former and longest-serving mayor of the City of Kitchener, will also be receiving the Order of Wilfrid Laurier University on June 16. “We’re really looking forward to having those individuals come and receive their awards and become part of the Laurier family,” Schwartz said.